You want to upgrade to an STI R180 rear differential – but you have a Legacy, Baja, Impreza, or Forester. Or even more hopeless, you think, because you have an EA-81 or EA-82. With my custom Hybrid Races – you can upgrade any of those, and keep you cost down by keeping your stock hubs! * The 21 spline axles have proved to be weaker than the 22 spline axles. If you have 21 spline axles, and are running more than 280-300 WHP, I would look into finding 22 or 28 spline axles. R160 shaft: Count your splines (inside the inner joint: 21, 22, or 28). R180 shaft: Count bearings on your inner joint (either 6 or 8). For inquiries and orders, click HERE. For those wanting to adapt SVX inner axle joints (for use in early JDM LSD) to OEM R160 shafts – this kit will work for you too. These races have been used in many cars from street use, to rally and drag use. I have sold many kits and have received awesome reviews. 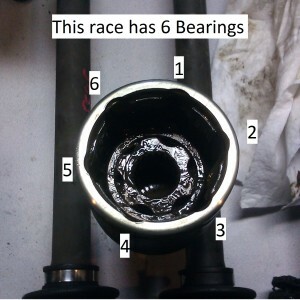 Disclaimer: Suberdave’s Hybrid Races are a performance part and carry no warranty.